Grrr if I jounce my forks there is a residue on the LHS fork slider that smells alot like pickled onion water! If I wipe this away and jounce again, there is less residue. If I do it for a third time its dry!!!!!! Anyone know what causes this? I would hate to tek the forks apart if there is not really a leak, but would also hate to leave em and spring a proper leak whilst on travels!!! Someone posted a linky dink to a kit with new sloiders and oil..........anyone know where that is? lift/slide up the dust cover and have a peak to see if any of that oil ya spilt is sitting there, what ever ya find wipe/wash it away and then jump up and doon on the fecker 2c if pickled onion water returns. Good plan Wicky, gonna go and try that noooo. I know how this is gonna work...the day afore RTT, the seal will let go proper and oil be burgered. This def aint spilt oil...its pickled onion water oi can smell the bassad. Have bought a couple of sets of them thur seals off ebay. Any suggestions for cheap/effective method of paint for front fork sloiders? I cant be arsed to Stove Enamel and was thunkin of just some satin finish Hammerite? Ya could try painting them with steel wheel paint, I painted some car carbs with it once & looked pretty good. Yeah I ordered two sets of the ebay seals (argh arrgggh argggghhh).....but seeing as I don't have much time to play with now, I also ordered a set from Damerells (and also top/bottom bushes as the teflon ripped off them when the forks were seperated, as Stinky mentioned). Also Haynes mentions the the top bush CAN'T "pass through" the bottom bush....so when you pull apart, all the components (seal/washer/top bush) come out of the slider at the same time on the end of the fork tube........they lie. Didnt have time to look at paint today. Have never heard of steel wheel paint, will pop into local auto place and see if they gots any, thanks for the tippola. 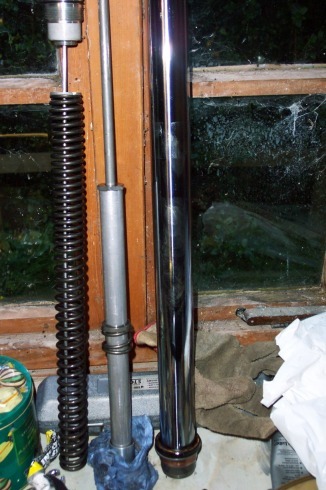 EDIT: I wont do anything with fork tube chrome....they are pitted on Pantaloonies set but not as bad as the ones on there. The seal thats gone? is on the leg where the chrome is fine!!! Go figure.....I jounced again today and no residue , they are gettin changed now anyway....work send them away and get em rechromed for £30 a leg, but it takes months to get em back.......gonna just rebuild as is....and then rebuild the ones that come off a bit more leisurely like. Haynes: "Install the oil seal washer with its flat side facing up" ......thats odd cos mine are both flat side facing doon....anyone know if Haynes is right or mine are right? Woud seem logical to have flat section facin doon to seaton top bush? I ruh roh! I was puzzled about that washer myself when I did mine. Like You, I thought the flat side should face down. Mine were as per Haynes's instructions and I installed them in the same way, flat side up. They seem to work fine so I guess they'll be fine either way. If You need new fork chrome tubes KEDO sells them at around 100EUR each. Excellent quality made by Wilbers. I bought a pair when I dropped my bike and bent the tubes a few years ago. Thanks for the washer and Kedo info Stinky. I will try them flat side up as these forks have obviously been apart before (nice gouges by the seal seat). Spoke to the Bentley boys and they recommended that I strip the sliders, use etching primer and then a standard (stain black) finish paint, 4 thin coats leaving 15mins drying time inbetween. Anyone got advice on how to drive the top bush into its housing in the sloider please? Haynes seems a little conufsed as it talks about a long drift bigger than the fork tube but smaller than the recess for the bush....and next its on about installing the washer and using that as a surface to drive on. First I protected the chromed fork legs with masking tape. Then I used the old bush and a small drift to drive the new bush in to it's housing. Gently tapping on the old bush pushed the new one in easily. Slightly oiling the bush made it a lot easier. Similarly old fork seals were useful when installing new ones. Make sure the forks are fully compressed when installing new bushed and seals so any possible damage wont be in the critical areas of the fork tubes. Protecting the drift with tape or something might be wise too. Thanks Stinky. I was hoping that because the bushes slotted they wouldnt be too hard to drift into place. Was planning on using a foot long section of poipe, but may well try the 'Stinky method' now...thanks. I have been trying to work out what could be done differently to save the bushes from destruction when dismantling but I think its inevitable! Hi guys! At last I have got into this forum! Took a long time, but I think I got here just in time. I did not see anywhere to post an intro here so I guess this is it for now. I need to change a fork seal on my '92 TDM 850. From what I read above by Mr Stink Foot, it sounds like I may need more parts. This looks like it might be more of a pain than doing the Buell fork that I just finished. I have the factory service manual but do not think highly of it. Most of the pix look like bad, dark, xerox copies. But it has got to be better than Haynes. I am hoping that I can do this without destroying those teflon coatings on the bushes, as mentioned above. I assume these are the bushings. Part #'s 14 & 16 in this pic? I will have to read through that a couple times again. Sorry to come on here with a bunch of questions right off, but riding season is about 6 months here & I am needy. If I can get some help, or be directed to somewhere on this site I would really appreciate it & do my best to give what pay back I can over the net. I have one of the few TDM's in Alaska. Maybe the only one. Have never seen another. There was one about 200 miles from here but I heard it was sold and went "outside". A term us old Alaskans use. That is anyplace outside Alaska. Mostly the lesser 48 states. Here is the TDM. Bought used in '01, & it is still pretty much like I bought it. Might as well toss in this one. Moose in back yard, somebody photochopped in the bike for me. I drilled a lot of holes in that Buell. It is a lot lighter than the TDM. 385 lb / 174.63 kilos with 1/2 tank of, em, er, -- petrol. Edited by Tom S, 19 June 2006 - 10:20 am. Still begging. Went back & PM'ed 'Plug' as per following. Hope this does not double post like it just did. Dammick! Reversed them maybe ok now. Where is that 'old' site? Plug, I find that I am in the same boat as you were. Can you help? How did you get the seal out. Can you be more specific? Just dig at it no doubt. I don't want to screw this up, just get it fixed & ride. And how do I find those posts on the "old" site, that I have not ever seen. New to the site & tried to get in to it for years. Weird. Sounds like you got it going without too much drama after Steve's post, but I would sure like to find the old site & those posts. Yes, That's exactly what I did. Prised everything off! Found a couple of posts on the old web site and thats how they said to change the oil seal, and then the discussion went onto changing the oil, as though thats alll there was to it... But as I've found, It's not that simple. I can't see how to get the oil out. Whats the other alternative... the one you have kind of mentioned. It sounds a bit more methodical and probably makes more sense. Please explain. Edited by Tom S, 19 June 2006 - 10:29 am. Thanks for the welcome Wicky. But then I would just have more work to do to fix it. Been a good bike. From experience I expect that from a "Ya-Mama!" Now I got the dust cover & the cheap, round, rusty little clip out, it looks like a pain to dig out that seal like I assume 'Plug' did. It is quite recessed down in there. My old eyeballs ain't that good sometimes either. Need to keep debris out of the oil. Trying to keep it simple. Need my SUV bike NOW! Don't want to be (thanks / apology to Pete Townsend, R Daltery & The Who) 'FORKED AGAIN!' by my own doing. So, how are your forking adventures going there Wick? Any tips? Edited by Tom S, 19 June 2006 - 03:12 pm. Q2: If you can find a method please let us know. The smaller bush (top bush) is probably reuseable but the bottom one is destroyed as the forks are seperated and the two collide. Haynes suggests that they just rest against each other, but what actually happens is the top bush rides over the bottom bush and detroys the teflon surface. Q3:Have not needed any special tools to dismanlte. There is a pic of the components shown above. If you want detailed pics of anything particular lettuce snow. A TDM in Alaksa, great! I've been up in your neck of the woods (Anchorage, Kodiak, King Salmon, Cordova) over the past couple of years - just getting ready to be up there next month. I like the summers, but the winters are not that bad - now Fairbanks is probably another story! To change the fork seal, remove the cap, spring, and adjusting rod. Pour out the old oil, then remove the bottom bolt, a air wrench will spin the bolt off without having to fab a holder for the damping rod. Remove the oil seal dust cap and retaining clip. Secure the fork leg in a vise, grap the fork tube, and pull up sharply, repeatly (like a slide hammer) to remove the fork tube from the leg. The fork bushings (#14 & #16) will usually be ruined when doing this. Replace them along with the fork seal. This is the only way, unless you can fab up a real thin and strong flat hook to slide between the fork tube and the seal lip to pry the seal out in-stu. Depending on how many miles on the bike, it might be time to relace the fork bushings anyway, as they do wear, especially if you ride alot on the 'normal' Alaska gravel roads. '87 XR600R To many mods to list, but it's street legal (sort-of)!